RONKONKOMA, N.Y., —March 8, 2013—Sigma Corporation of America, a leading researcher, developer, manufacturer and service provider of some of the world’s most impressive lines of lenses, cameras and flashes, today announced the pricing and availability of three new lenses from its ART lens category, including two lenses for mirrorless interchangeable lens cameras and one lens for DSLR cameras with APS-C size sensors. The updated 30mm F1.4 DC HSM lens will be available in late March for the street price of $499 in Sigma, Canon and Nikon mounts. The 30mm F2.8 DN and 19mm F2.8 DN lenses, which are available for both Micro Four Thirds and Sony E-Mount camera systems, will be also be availablein late March for the street price of $199. All three lenses are existing focal lengths that have been redesignedand quality-control tested with Sigma’s proprietary modulation transfer function (MTF)“A1” measuring system as part of Sigma’s new Global Vision category restructuring.The original 30mm F1.4 from Sigma helped the family-owned manufacturer pioneer the large-aperture, APS-C format, standard lens category in 2005. Now, it boasts new optical configurations and an optimized focusing system. Both DN lenses incorporate telecentric optical designs and a linear, auto focusing motor that ensures accurate and quiet focusing for video recording. They have metal exteriors and a simply shaped focus ring, with varying textures to distinguish each part of the lens. In addition, DN users can choose between a black or silver finish on these lenses. Sigma 19mm F2.8 DN – This high-performance, wide-angle lens has an angle of view equivalent to 38mm on the Micro Four Thirds system and 28.5mm on the E-mount system (35mm equivalent focal length). As a wide-angle lens with excellent mobility, it is ideal for studio photography, architecture and starry skies. Its minimum focusing distance is 7.9 inches and its maximum magnification is 1:7.4. 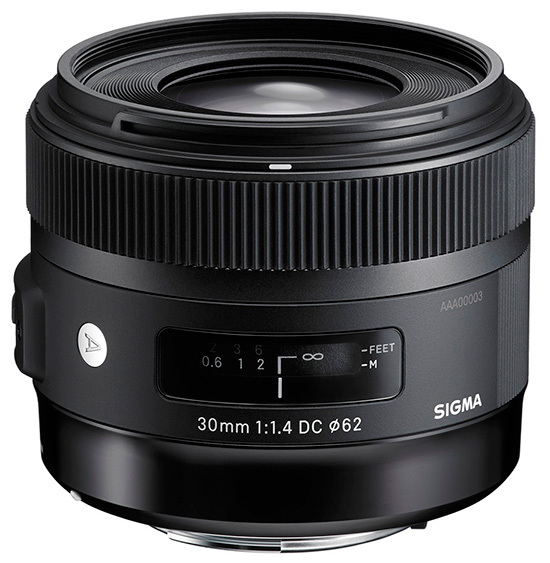 Sigma 30mm F2.8 DN – This high-performance, standard lens has an angle of view equivalent to 60mm on the Micro Four Thirds system and 45mm on the E-mount system (35mm equivalent focal length). This lens, which is perfect for casual and formal portraiture, documentary photography, travelogues and everyday shooting, includes a double-sided aspherical lens that enhances its optical performance. Its minimum focusing distance of 11.8 inches and its maximum magnification is 1:8.1. 30mm F1.4 DC HSM –With new optical configurations of eight elements in nine groups, as well as rounded aperture blades, the updated30mm F1.4 lens delivers pleasing sharpness and beautiful bokeh. Its angle of view is equivalent to 45mm on a 35mm camera (which is similar to that of human vision), its minimum focusing distance is 11.8 inches and its maximum magnification ratio is 1:6.8. The lens’ optimized power distribution helps to minimize field curvature, prevent a loss of image quality at the edges of photographs and produce outstanding image quality. Its double-aspheric lens minimizes spherical distortion, astigmatism and coma, and its rear focus system prevents focus-dependent variation in aberration. Together, the new optimized auto focus (AF) algorithm and rear focusing system ensure smooth and accurate focusing. The new 30mm F1.4 is also compatible with Sigma’s new USB Dock, which will enable firmware updates and focusing adjustments, and is expected to be available in coming months. This entry was posted in Sigma. Bookmark the permalink. Trackbacks are closed, but you can post a comment.